This is one of those kinds of shots that will remain in my portfolio forever. 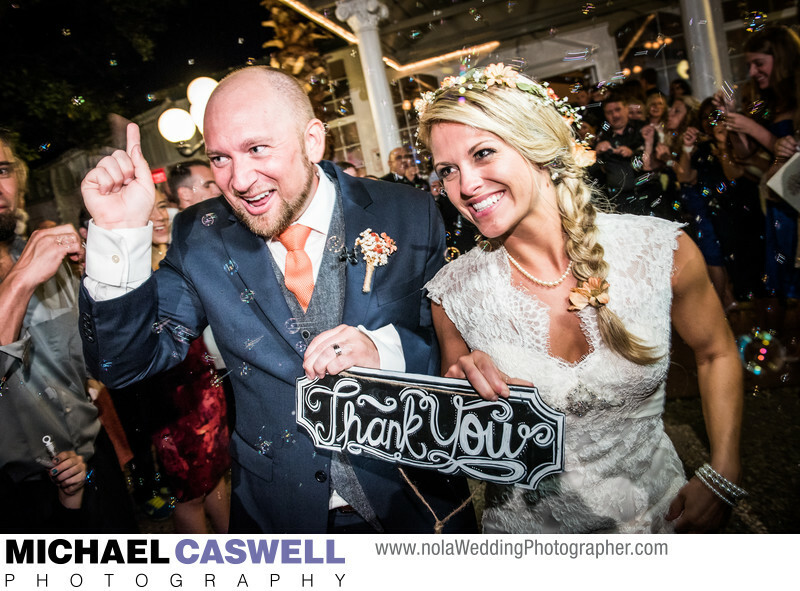 At the historic Michabelle Inn in Hammond, Louisiana, which is about an hour north of New Orleans, this broadly smiling couple departs through a swirling cascade of bubbles blown by a delightfully chaotic crowd of guests at the end of their wedding reception. They had intended to, at some point during the reception, go out to the front of the mansion to get photographs of them holding their Thank You sign to use for cards to mail out after the wedding, but remained so engaged with their family and friends throughout the night that they simply ran out of time. So instead, they decided to just hold the sign as they departed at the end of the night for all the present guests to see, making an image that was perhaps not what they had originally conceived, but one that was far more memorable. It captured the joyful conclusion to their magical evening with a completely natural and unposed shot. Michabelle Inn is a lovely venue located in Hammond, Louisiana about sixty miles from New Orleans. The front of the stately mansion is perfect for an outdoor wedding ceremony, and there is a nicely sized and attractive indoor reception space located right behind. The venue also features ample space for the bride and bridesmaids, and groom and groomsmen to get ready, with rooms in the main house as well as separate cottages tucked away in the lushly landscaped grounds. Location: 1106 S Holly St, Hammond, LA 70403.